Mayor Jenny Durkan launched a nationwide search earlier this year after Kathleen O’Toole stepped down as police chief at the end of 2017. Three finalists for the Seattle police chief job will be announced during a 2:30 p.m. Friday news conference at City Hall, Mayor Jenny Durkan’s office said Thursday night. Durkan will not attend the news conference, leaving the announcement to leaders involved in the nationwide search, her office said. 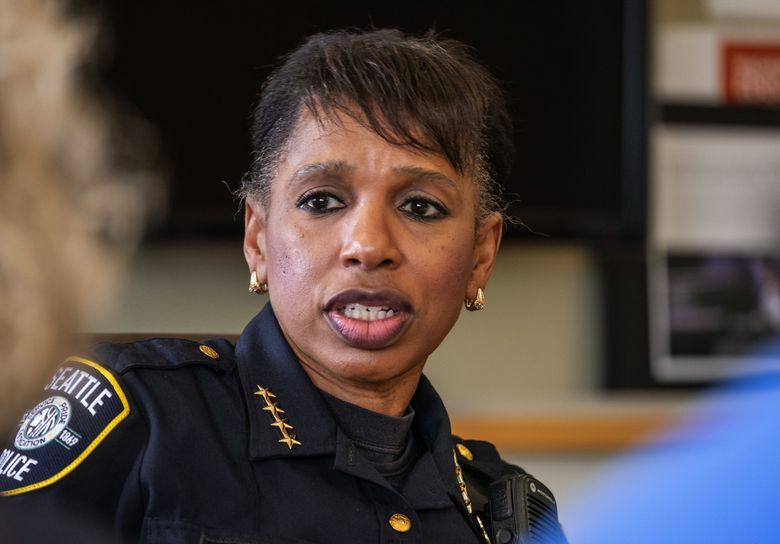 Interim Seattle Police Chief Carmen Best is one of five people being considered for the department’s next police chief, according to sources familiar with the search. The finalists will be chosen from that group. Durkan launched the search earlier this year after Kathleen O’Toole stepped down as chief at the end of last year. Best, who began serving as interim chief on Jan. 1, announced her candidacy the previous month after O’Toole disclosed her plans. The names of the four other candidates have not been disclosed, but they are from outside the department, one source said. The five candidates were submitted to the mayor’s office earlier this week by a search committee consisting of four co-chairs and more than 20 members. The committee interviewed six candidates last week after receiving about 60 applications that were initially narrowed to 10 candidates. The five semifinalists were asked to answer written questions this week as part of a comprehensive examination process, required under the city charter, that included background checks and work done by the search committee and input from the search-committee chairs, another source said. The answers will be evaluated by a group of assessors assembled by Durkan: former King County Executive Ron Sims; Senior Deputy Mayor Michael Fong; the mayor’s legal counsel, Ian Warner; Deputy Mayor Shefali Ranganathan; and Barney Melekian, the mayor’s public safety adviser, according to a third source. All the sources spoke on condition of anonymity because they weren’t authorized to discuss the search process. Sims served as co-chair of the police-chief search committee that presented three finalists to former Mayor Ed Murray in 2014, leading to the hiring of O’Toole. Melekian, who also served as an adviser to Murray, has been credited with recruiting O’Toole. He is currently the undersheriff in Santa Barbara County, California, serving as second in command in the sheriff’s office, and has served in various law-enforcement agencies in California and the U.S. Department of Justice. The list of three finalists will be forwarded to Durkan by the assessors and the four search-committee chairs: Jeff Robinson, a longtime Seattle attorney who is a deputy legal director and director of the American Civil Liberties Union’s Trone Center for Justice and Equality; former Seattle City Council member Tim Burgess; Colleen Echohawk, executive director of Chief Seattle Club; and Sue Rahr, former King County sheriff and current executive director of the Washington State Criminal Justice Training Commission. Durkan, who will interview each finalist, is expected to announce her choice for the job by late June or early July, which is subject to confirmation by the city council. The search process included 14 community meetings and an online survey completed by 2,600 people. On Thursday, the Community Police Commission submitted a letter to Warner, the mayor’s legal counsel, asking for more information on the examination process.